My family loves sweet potatoes. We grow and eat a lot of them (read about my first sweet potato growing experience) and I’m always excited to try new ways to use them. Bacon and lime are always a great combination and are delicious with the sweetness of the roasted sweet potatoes. I prefer to dirty as few dishes as possible, so meals that can be made in one pan make me very happy. For this recipe, there’s no need to precook the bacon. Dice the bacon and put it in the bottom of a cast iron skillet or on a sheet pan. Then just toss diced sweet potatoes on top to roast. While everything is cooking, I make a simple lime and balsamic vinaigrette to pour over the top. 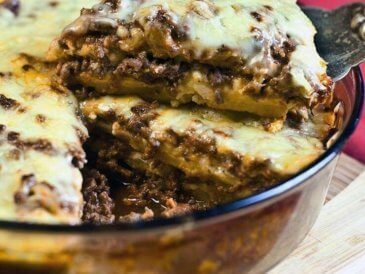 This versatile recipe is delicious no matter how you enjoy it. You can either eat it warm from the oven or make it ahead and refrigerate it for a chilled side later. You can add eggs to the leftovers for a breakfast scramble, eat it as a stand-alone lunch, or add some leftover chicken for dinner. 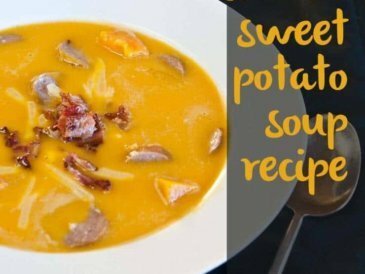 Loaded Sweet Potato Soup – What could be more satisfying on a cold day than sweet potato and squash soup loaded with spices, sausage, and onion and topped with cheese and bacon? 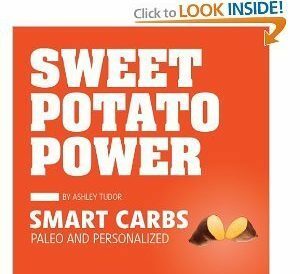 Stuffed Sweet Potatoes – Sweet potatoes stuffed with sausage, spinach, and cheese — they’re a complete meal or lunch to go. 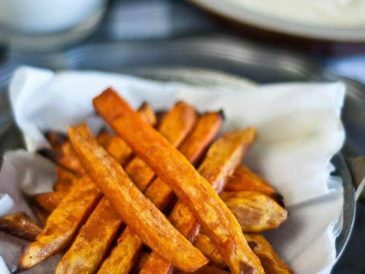 Sweet Potato Fries – A kid favorite with mom-approved nutrition — serve with homemade ketchup. Meatloaf Cupcakes with Sweet Potato Frosting – Yup, you read that right — delicious, healthy, and kid approved! Sweet Potato Casserole – A real food version of the Thanksgiving favorite, made with homemade marshmallow topping. Next I might try using my mandolin to make healthy sweet potato chips like these. I’ll bet they’d be delicious alongside homemade fish sticks. 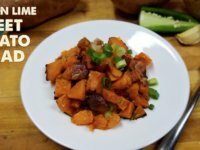 This delicious dish combines sweet potatoes, bacon, lime, and balsamic vinegar to create a flavorful and simple meal. Dice the bacon and place it on a rimmed baking sheet or in a large cast iron skillet. Peel and dice the sweet potatoes and place them on top of the bacon. Roast in the preheated oven for 20-25 minutes or until the bacon is crispy and the sweet potatoes are soft. 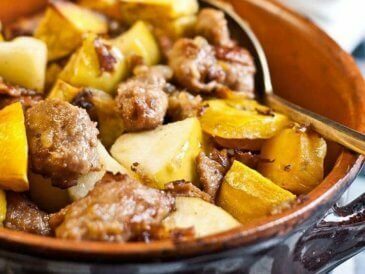 While the bacon and sweet potatoes are cooking, whisk together the olive oil, balsamic vinegar, and lime juice and zest. Mince the jalapeno, garlic, and green onion and add it to the olive oil/balsamic mixture. 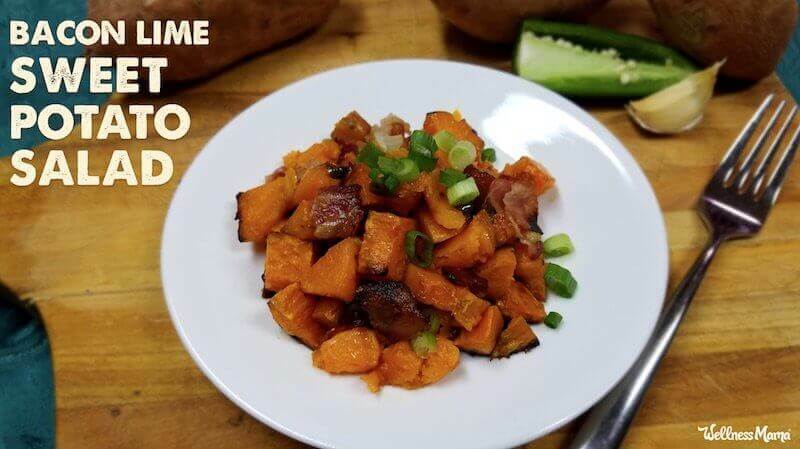 When the bacon and sweet potatoes are cooked, transfer them to a large serving bowl. Toss with the vinaigrette and enjoy warm or cold. This dish is awesome for any meal -- you can add leftover diced chicken or steak if you want to up the protein. 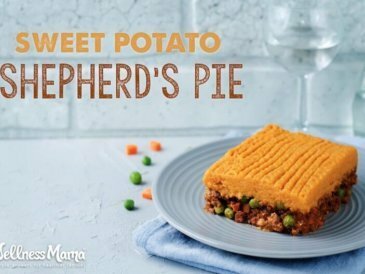 What’s your favorite way to use sweet potatoes?